Will GOP’s Red Scare Anti-Socialism Message Work in 2020? Republicans Are Going to Try the ‘Red Scare’ Strategy Again. Will It Work? At least FDR was indeed advocating significant new public policy restraints on private enterprise, if not anything you could really characterize as “socialist” by historic standards. But the same label was applied to virtually every post–World War II Democratic president other than perhaps Jimmy Carter. In 1945 the American Medical Association attacked Harry Truman for advocating “socialized medicine” (the same label they would attach to the original Medicare and Medicaid programs as advocated by LBJ). Shortly into the presidency of the resolutely centrist Barack Obama, the Republican National Committee very nearly adopted a resolution calling on all their partisans to begin referring to the opposition as the “Democrat Socialist Party.” And soon after another centrist Democrat, Hillary Clinton, beat back a challenge from that rarest of beasts, a self-identified socialist running a viable presidential nomination campaign, she encountered widespread conservative claims that Donald Trump was the only thing standing between a virtuous America and a “tsunami of leftism,” or perhaps socialist totalitarianism. But how effective will it be? That could depend on a number of variables. When asked to explain their understanding of the term “socialism,” 17% of Americans define it as government ownership of the means of production, half the number who defined it this way in 1949 when Gallup first asked about Americans’ views of the term. Americans today are most likely to define socialism as connoting equality for everyone, while others understand the term as meaning the provision of benefits and social services, a modified form of communism, or a conception of socialism as people being social and getting along with one another. About a quarter of Americans were not able to give an answer. Views of “socialist” politicians are inconsistent, too. On the one hand polls show being “socialist” as the most undesirable quality for a presidential candidate. On the other hand, the one viable self-identified socialist to run for president, Bernie Sanders, is consistently the most popular United States senator, and his national favorability ratio (54/38 according to Gallup late last year) is positive if not sensational. In terms of policy positions arguably identified with “socialism,” the record is murky as well. Despite GOP efforts to scare people about Medicare for All as a socialist abomination, it’s generally quite popular, even among rank-and-file Republicans. Heavy taxation of the very wealthy, another “socialist” proposal, is popular as well. There are a number of scenarios for how this latest “socialism” debate will play out between now and November 3, 2020. The rapidly approaching Democratic presidential nominating contest will soon begin to capture some of the enormous attention currently being paid to congressional socialists like AOC and Rashida Tlaib (and their close ally Ilhan Omar), and with it some of the “Democrats are moving to the hard left” talk that has dominated political coverage since the midterm elections. But if any self-identified “moderate” presidential candidates choose to make the 2020 primaries a “struggle for the soul of the Democratic Party” and issue their own warnings about incipient socialism (which Republican pols and conservative media would happily amplify), the same debate would continue with a slightly different cast of leading characters. And if this hypothetical loud-and-proud moderate does poorly in the polls and then in the primaries, the perception that the party has chosen to move left will be enhanced. That is particularly true if Bernie Sanders wins the nomination. The salience of attacks on Democrats as the party of “socialism” becomes less clear if presidential candidates who aren’t clearly “moderate” but who disclaim any “socialist” allegiances do well. Kamala Harris, Elizabeth Warren, and Beto O’Rourke have all gone out of their way to proclaim themselves as aiming at the reformation of capitalism, not socialism. But then again, Harris and Warren, along with Cory Booker and Kirsten Gillibrand, all signed onto the Senate resolution encompassing the Green New Deal with its very big government implications. Republicans are very likely to continue their attacks on Democrats as one big happy socialist family, forcing them either to fight over acceptance or rejection of the label or grin and bear it through a sustained red scare. 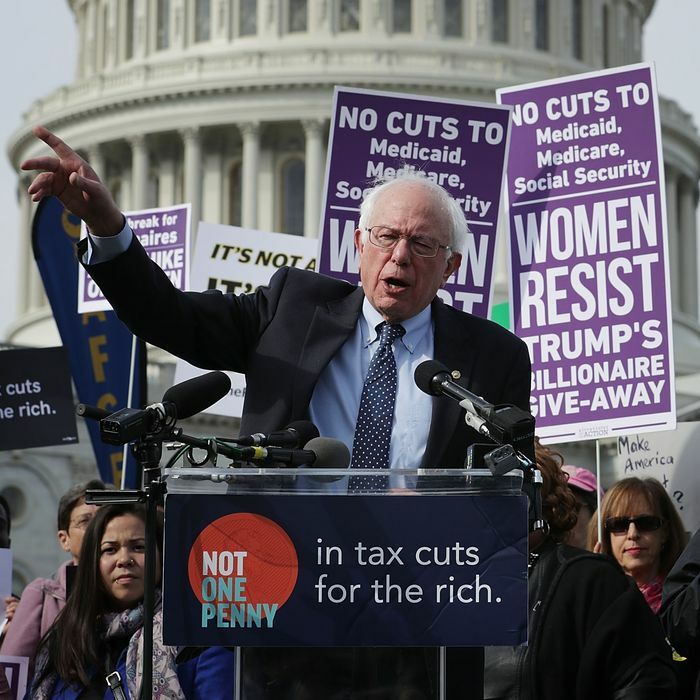 In the end Donald Trump’s record and character may cast so large and ominous of a shadow over the country in 2020 that nobody much cares whether the candidate who challenges him is a firm capitalist-roader or something to the left of that. Indeed, while it’s very likely the 2020 Democratic presidential campaign will be significantly more out-front progressive than Hillary Clinton’s indistinct and largely negative 2016 effort — barring some shocking Hickenlooper boom in the primaries — it might be best for the party to postpone any struggle for its soul until Trump is gone. But without question, Trump’s MAGA legions will try to force the issue, loudly. Will the GOP’s ‘Red Scare’ Message Be Effective in 2020?